From the arrival of Europeans until the 20th century, Newfoundland was valued mainly for its rich marine resources. Cod was the most important of these, and was the primary catch for fishermen until the 1992 cod moratorium. Fresh frozen fish played a significant economic role in the provincial economy from the 1950s, but before then the mainstay of the Newfoundland fishery was the production of salt fish, meaning salt cod. Salt cod was produced almost exclusively for export to other countries, and Newfoundland's dependence on foreign markets, both for exports of fish and imports of food, supplies, and manufactured goods, played a crucial role in its economy. The success of Newfoundland exporters (and therefore of the fishermen who were the producers) depended upon the price of fish in foreign markets. Prices fluctuated due to trade relationships, competition from other countries, the amount and quality of the fish produced, market demand, and other factors. From 1793 to the 1850s, Newfoundland's markets for salt fish underwent many changes that would determine the economic success of the fishery, and the Newfoundland economy generally. Early prosperity in this period caused by war was tempered by peace and the loss of the major market, Spain. By the 1850s though, this loss had been more than offset by other markets. The period 1793-1815 was crucial for the social and economic development of Newfoundland, and the fishery especially. Great Britain was almost continuously at war with France, culminating in the Napoleonic Wars of 1803-1815. From 1812-1814, Great Britain was also at war with the United States. These conflicts disrupted trade and increased demand for food stuffs, which kept the price of salt fish high. Because of naval blockades, preferential tariffs and trade agreements, Newfoundland exporters temporarily enjoyed a near-monopoly on the North Atlantic salt cod trade. The principal markets were Spain, Portugal (both British allies), and the British West Indies. The Spanish market was the most important - about 400,000 quintals (the standard measure of 112 pounds of fish, also known as a hundredweight and abbreviated cwt) went to Spain in 1814, nearly half of Newfoundland's salt fish production that year. 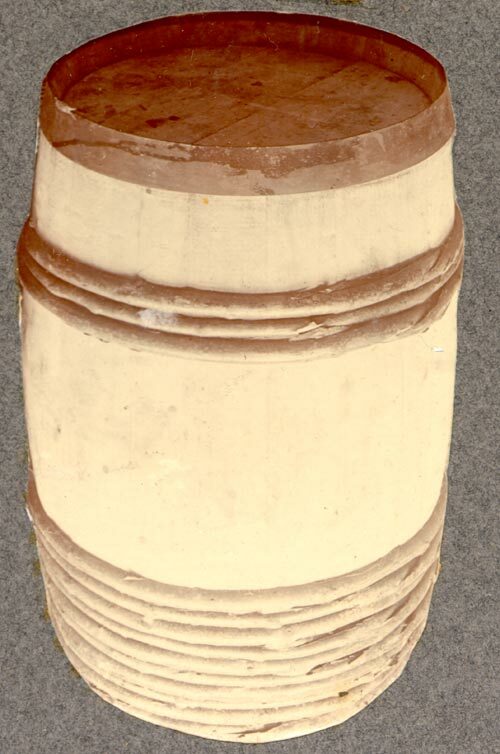 Salt cod fish was packed in shipping barrels like this for transport to market. Photographer unknown. From the Job Photograph Collection, Maritime History Archive. Reproduced by permission of the Maritime History Archive (PF-315_135), Memorial University, St. John's, NL. With the coming of peace in 1815, foreign competitors reappeared, and import tariffs began to affect Newfoundland's salt fish exports. Spain ended its preferential tariffs on British (and therefore Newfoundland) goods in 1814. Tariffs on Newfoundland salt fish increased rapidly to match the tariffs charged on fish from competing countries such as Norway and the United States. The result was a significant drop in Newfoundland exports to the Spanish market. By the 1820s, Spain was only buying about 80,000 quintals of Newfoundland salt fish annually, compared to about 400,000 quintals in 1814. Exports recovered somewhat in terms of volume by the late 1840s - 291,000 quintals in 1848 and 230,611 in 1849 - but in relative terms this represented only 32 percent and 20 percent of Newfoundland's total salt fish exports, respectively. 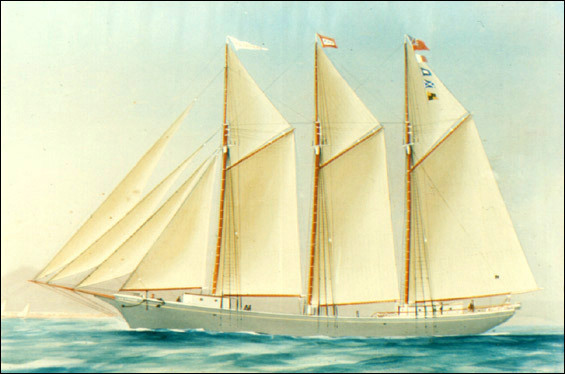 Schooner A. V. Conrad, n.d. The A. V. Conrad carried salt fish from Newfoundland to Southern Europe, Brazil, and the Caribbean. Painter unknown. From the Dr. Harry Roberts Slide Collection, Maritime History Archive. Reproduced by permission of the Maritime History Archive (PF-008_019), Memorial University, St. John's, NL. In 1814, Spain had accounted for about 50 percent of Newfoundland's exports. Market gains in Portugal and Italy, however, helped to compensate for the loss of Spanish markets. Newfoundland had always sold salt fish to Portugal, but this market became more important after 1810, when a new trade agreement with Great Britain allowed Newfoundland salt fish to enter at a tariff rate of 15 percent, compared to 30 percent for competing countries. Newfoundland exported an average of 300,000 quintals of salt fish annually to Portugal during the 1810s. Data are scarce for the following decades, but historian Shannon Ryan estimates that exports remained at that level through the 1820s and 1830s, possibly reaching 400,000 quintals a year or more. There is evidence that Portugal consumed half of Newfoundland's salt fish exports in 1837. Thereafter, however, Newfoundland fish no longer enjoyed a preferential tariff, and the Portuguese government began encouraging its own fishermen to become involved in the cod fishery. Newfoundland exports of salt fish to Portugal therefore declined somewhat after 1838, but it remained an important market. Markets in Italy, which was not unified at this time and consisted of various city-states, also became important, especially Leghorn (Livorno), Naples, and Genoa. From 1814-1828 Italian markets purchased about 170,000 quintals of salt fish annually. The trade declined during the 1830s, but recovered considerably by 1860. Tariffs were favourable to Newfoundland salt fish exports, and at least one Italian city (Leghorn) developed a preference for Labrador cured salt fish. Brazil also developed into an important market. Shipments began only in 1808, when Brazil was still a Portuguese colony. For about ten years sales were low. But exports increased substantially after 1819, helped first by Portugal's preferential tariff, and after 1825 by a similar tariff agreement with newly-independent Brazil. During the period 1824-1833 shipments ranged between 32,000 and 85,000 quintals. The preferential tariff agreement expired in 1844, but Brazil continued to be a vital market for Newfoundland exports. Competitors such as Norway and the United States were unable or unwilling to supply the Brazilian market, and Newfoundland was able to produce the small, very dry cure that Brazilians preferred. The final major market for Newfoundland salt fish at this time was the West Indies. Though the French and Spanish West Indies, and the Dutch and Danish Caribbean possessions were markets for Newfoundland salt fish, it was the British West Indies that consumed the most. The French colonies, naturally, depended almost entirely on imports of French salt fish, and in the Spanish possessions Newfoundland faced many competitors. The British West Indies included Jamaica, Barbados, British Guiana, Trinidad, Grenada, Dominica, St. Vincent and St. Lucia. Their major products were sugar cane and its derivatives (including molasses and rum), and its economy, at least until the abolition of slavery in 1833, depended upon slave labour. Plantation owners needed a cheap and durable source of protein for their slaves (and later their free workers), which Newfoundland salt fish provided. Exports to the British West Indies reached over 150,000 quintals in 1810 and 1811. There were major fluctuations in the 1810s, peaking at 176,000 quintals in 1816, but from 1817 to 1833, exports of salt fish averaged 127,000 quintals annually. The British West Indies continued to be important to the Newfoundland salt fish industry throughout the 1840s and 1850s. Exact figures are hard to come by for this period, but 140,000 – 160,000 quintals per year is a good estimate. 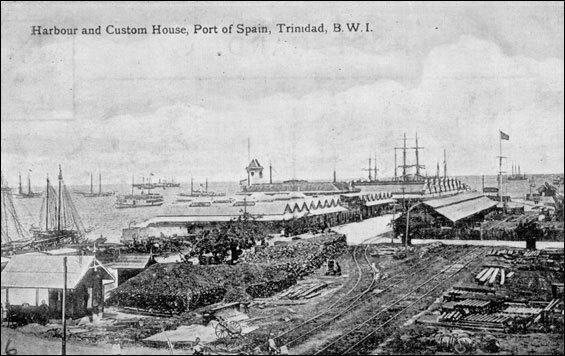 Harbour and Custom House, Port of Spain, Trinidad, n.d. The British West Indies was a major market for Newfoundland's salt fish exports. Photographer unknown. From the Capt. Harry Stone Collection, Maritime History Archive. Reproduced by permission of the Maritime History Archive (PF001_j026a), Memorial University, St. John's, NL. During the Napoleonic Wars, the Newfoundland fishery enjoyed a near monopoly on the salt fish trade. By the 1850s, Newfoundland was competing with salt fish producers in Canada, the United States, Iceland, Norway, France and Portugal. Nevertheless, Newfoundland was still producing large amounts of salt fish, and exported an annual average of over 920,000 quintals in the 1820s. This number dropped to about 800,000 during the 1830s, but recovered to about 970,000 in the 1840s. The 1850s were even more productive, with an average 959,000 quintals produced per year from 1851-1855 and 1,237,000 from 1856-1860. Newfoundland's salt fish was now going to Spain, Portugal, Italy, Brazil, and the British West Indies. One of the reasons for Newfoundland's presence in many different markets was that its fishery produced many different grades of salt fish (see 19th Century Trade), and could therefore supply markets with different requirements. Spain and Portugal demanded higher quality fish, for example, while the British West Indies preferred poorer quality (and therefore cheaper) varieties and cures. All of these regions needed cheap and well-preserved sources of protein, and produced goods that could finance the purchase of salt fish, such as fruit, wine, nuts, oils, and sugar. Heading into the second half of the nineteenth century, Newfoundland had a well-developed network of markets for its staple product.